Have you ever watched clouds on a summer day? Some clouds are white, fat and fluffy. They float high in the sky. Others are low, gray and thin. They might even look a little green. Scientists have discovered several kinds of clouds and named them. Watching the clouds is not only fun, but it can give you clues about what kinds of weather are coming. Tiny droplets of water in the air rise with warm air. As they rise, they get cooler. They combine with other droplets of water to form clouds. Clouds are white because they reflect light from the sun. Gray clouds become so filled with water that they don’t reflect light. Masses of clouds form shadows, which can also cause the clouds to look gray. Cumulus clouds look like fluffy tufts of cotton floating in the sky. Sometimes they might take the shape of a dragon, a turtle or some other creature. 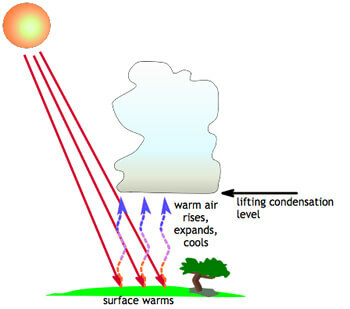 You’ll see cumulus clouds on warm, sunny days. Cumulus clouds look like fluffy tufts of cotton floating in the sky. Sometimes they might take the shape of a dragon, a turtle or some other creature. 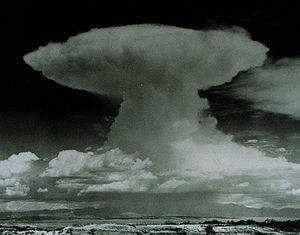 Cumulonimbus clouds are large, flat clouds that spread across the sky. One end of the cloud might be shaped like an anvil. Cumulonimbus clouds mean a storm or thunderstorm is coming. Sometimes they bring hail, snow or tornadoes. Contrails are the white streaks left behind by airplanes. Heat from the exhaust pipes mixes with cold water droplets to make icy, white crystals. 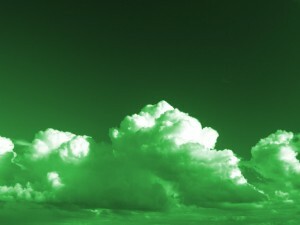 Green clouds often mean a tornado is coming. Cirrus clouds are high in the sky. They are wispy and small. Watch cirrus clouds move across the sky and you’ll know where the next weather pattern is coming from. Cirrus clouds usually mean a change in weather. Cirrostratus clouds are high and thin. They look like a big, rippling sheet across the sky. Cirrostratus clouds usually mean rain or snow is coming. Altostratus clouds are low and gray or white. They cover the whole sky and look soft. They mean snow or rain is coming. Cumulonimbus clouds are large, flat clouds that spread across the sky.Cumulonimbus clouds mean a storm or thunderstorm is coming. A video explaining cloud formation. 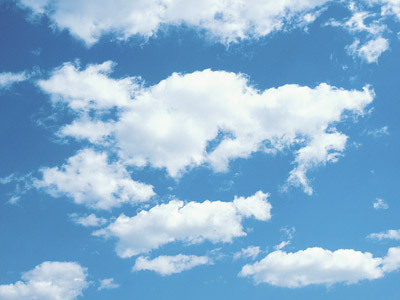 Enjoyed the Easy Science for Kids Website all about Clouds info? Take the FREE & fun all about Clouds quiz and download FREE Clouds worksheet for kids. For lengthy info click here.